I always have fun working with Marsha McBride, the owner and chef at Cafe Rouge Restaurant (& Meat Market). She has a fantastic sense of humor so each project is guaranteed to make me smile. 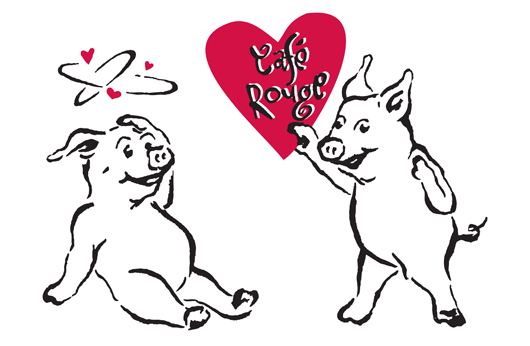 Here are two of the pig characters that I created for Cafe Rouge’s house wine label some years ago. Over time we’ve been able to adapt these funny illustrations for all sorts of things; ad posters, signs, even holiday cards… and now Valentine’s Day! 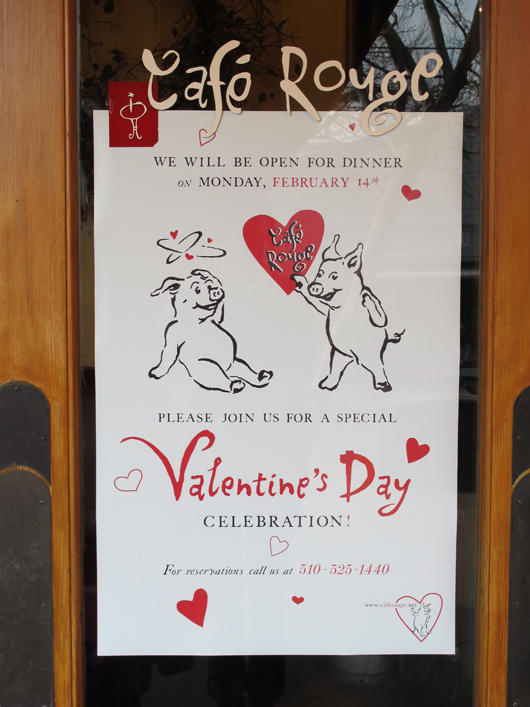 Here is the Valentine poster I created, hung on the front door of the restaurant. I never tire of these funny little pig characters! 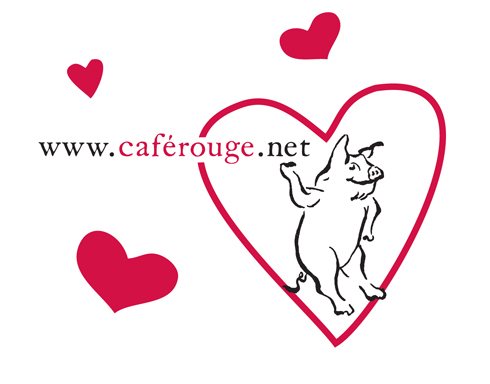 Valentine’s Day is fast approaching, don’t forget to make a reservation! 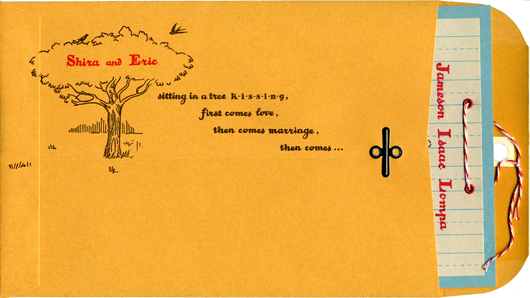 I have always wanted to tell the story behind my dear friend, Maria’s, wedding invitation design. The above image is the incredible reference/inspiration material that Maria first brought to me. 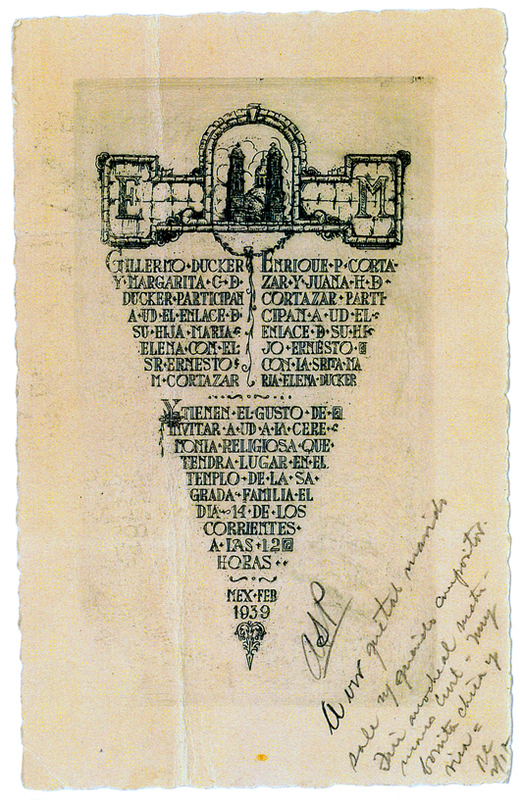 She had found this invitation, from Mexico circa 1939, amongst her Grandmother’s things. The moment I saw it I knew I had died and gone to heaven! The design is so spectacular and unusual. 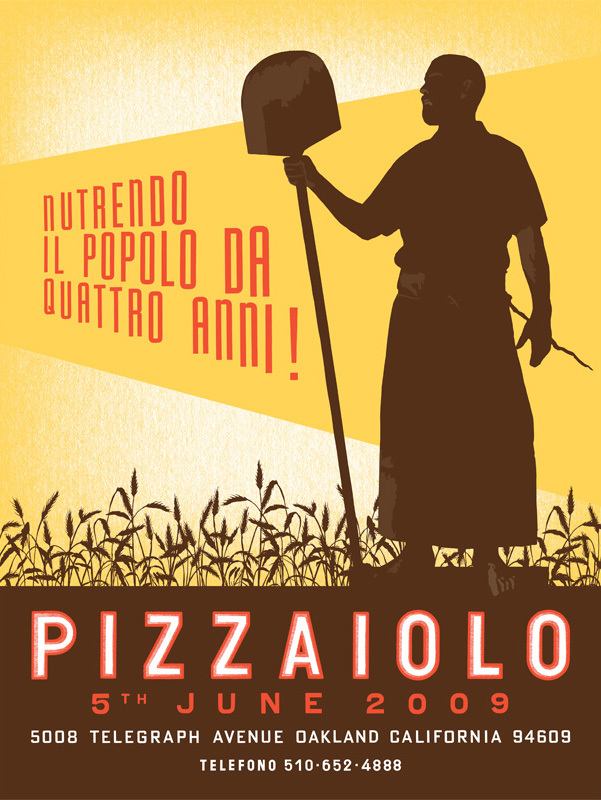 The hand-lettering, as well, is so interesting… I had never really seen anything like it. I loved studying every detail and recreating the design for Maria and Darius. 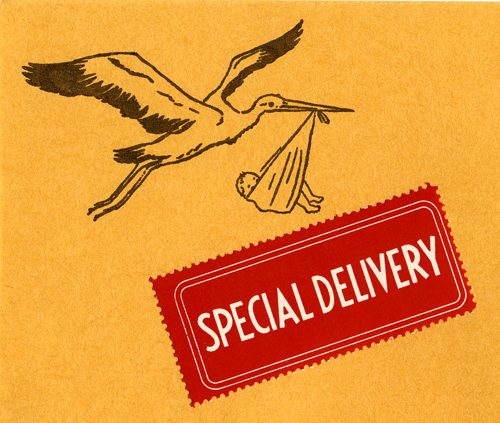 Here is the invitation that I created. I hand-lettered the new text which remained written in Spanish. The translation of the wording is so beautiful, with both the parents of the groom (on the right) and the bride (on the left) inviting you to “witness the interlacing of their children”. Just the word “interlacing” conjures up such romantic emotion! The vine dangles symbolically, separating the bride’s and groom’s families until the mention of their wedding day, at which point, the vine ends and the text comes together to create a singular point. 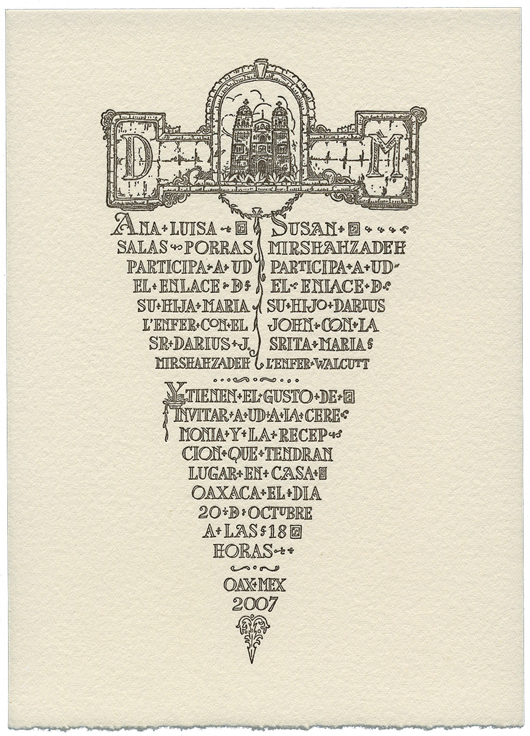 The initials at the top also create a “crossing over” with the groom’s initial on the bride’s side and vice-versa … such symbolism! I replaced the initials with an “M” and a “D”… for Maria and Darius. I redrew the header illustration and decorative elements. 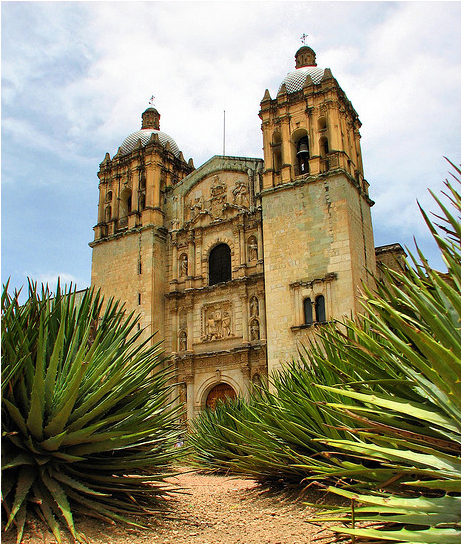 Their wedding took place in Oaxaca, Mexico so we decided to have the header illustration feature a church that is very prominent there; Templo de Santo Domingo de Guzmán. 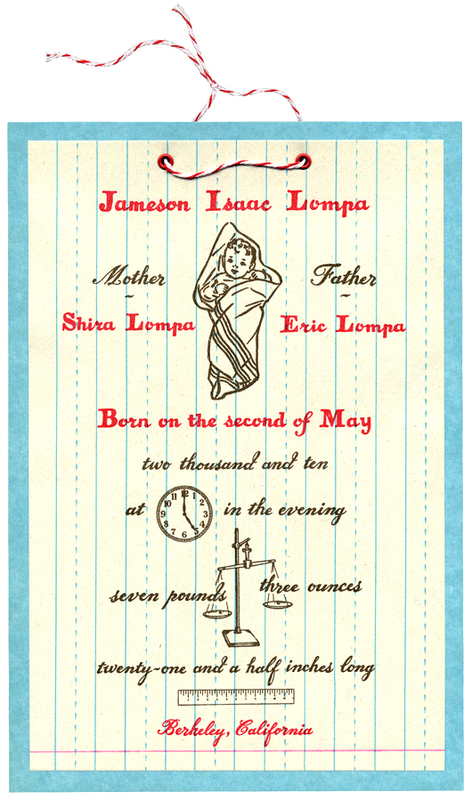 Here is the RSVP card. I love all the unique decorative symbols mixed into the wording. I love how the return address design fit the flap of the envelope perfectly. Here is the menu for their wedding day feast! I was so fortunate to attend this wedding, truly one of the most amazing weddings ever! Thank you Maria, love to you both. 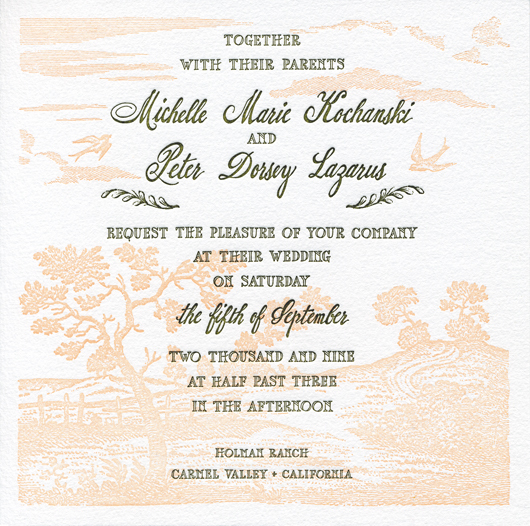 The weather is so dreamy today… it seemed appropriate to post about this wedding invitation. The wedding took place on a beautiful ranch in Carmel Valley… almost one year ago to the day. I love how the illustration became a dreamy backdrop for the invitation wording, creating an inviting scene which draws you in, walks you through the trees and along the path to a magical event. Happy Anniversary Michelle and Peter! I have always loved old botanical prints. 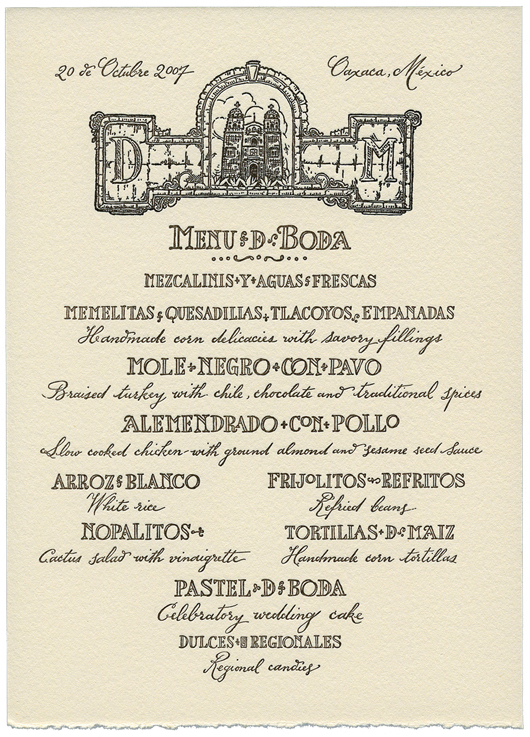 I created this menu cover for a intimate wedding feast. 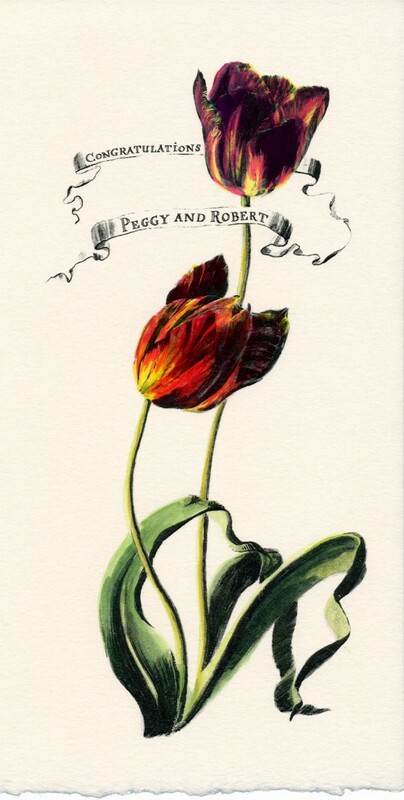 I used a black and white image of tulips from an old book and hand-lettered the bride and groom’s names in the ribbon banner. There were a small number of guests attending this dinner so I was able to hand-paint the tulips on each menu. The results were beautiful. Each guest receiving their own little painting. Aya Brackett is a very talented photographer and dear friend. She did the photography for my website and my work has never looked better! I was also lucky enough to work with her on her wedding invitations. She had wonderful ideas and reference material and we had a great time working together. I am a true believer in having bride’s provide inspirational material, stories, photographs, etc. 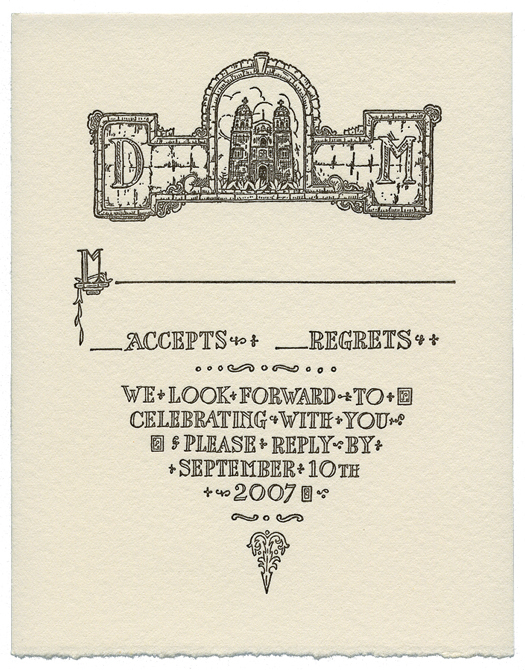 to inform the design of their invitations. The results are so personal, special, and unique. Designing for weddings is the best form of story telling I can think of… it satisfies and inspires the romantic in me. 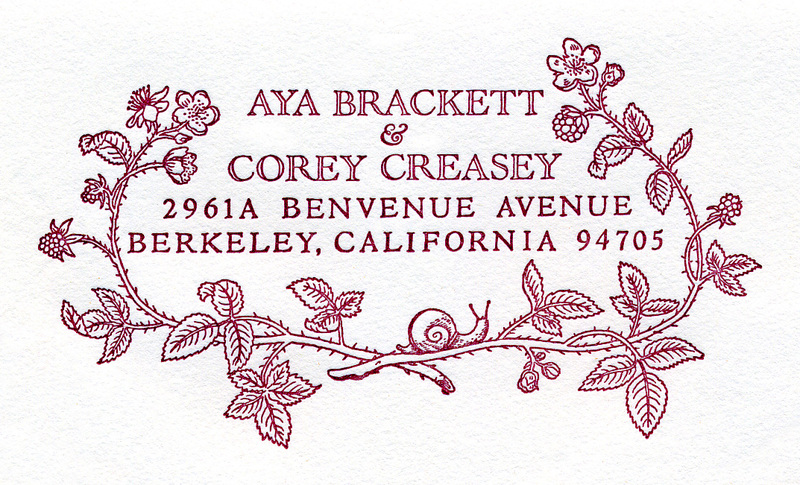 Aya brought me this gorgeous business card from her favorite Patissier in Paris. 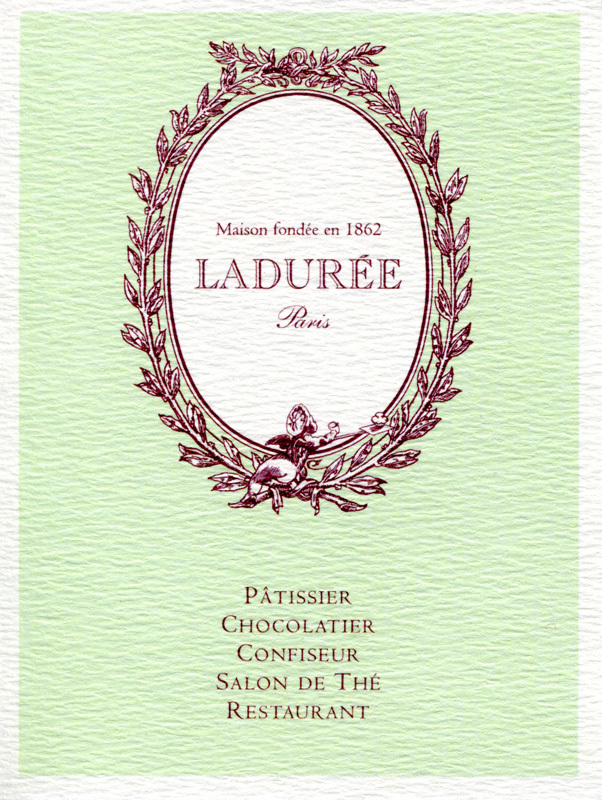 We both loved the symbolism in the intertwined branches, the fresh color palette, and the lettering style of “Laduree”. 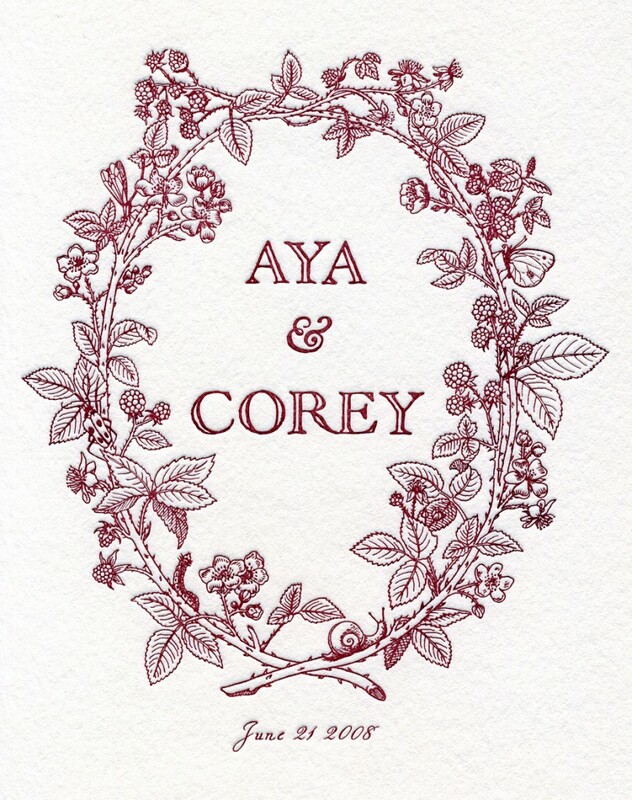 Aya & Corey married in the quaint ‘ghost town’ of North Bloomfield, in the foothills of the Sierra’s. Their ceremony was held in a beautiful meadow surrounded by woodlands and lots of wild blackberry! 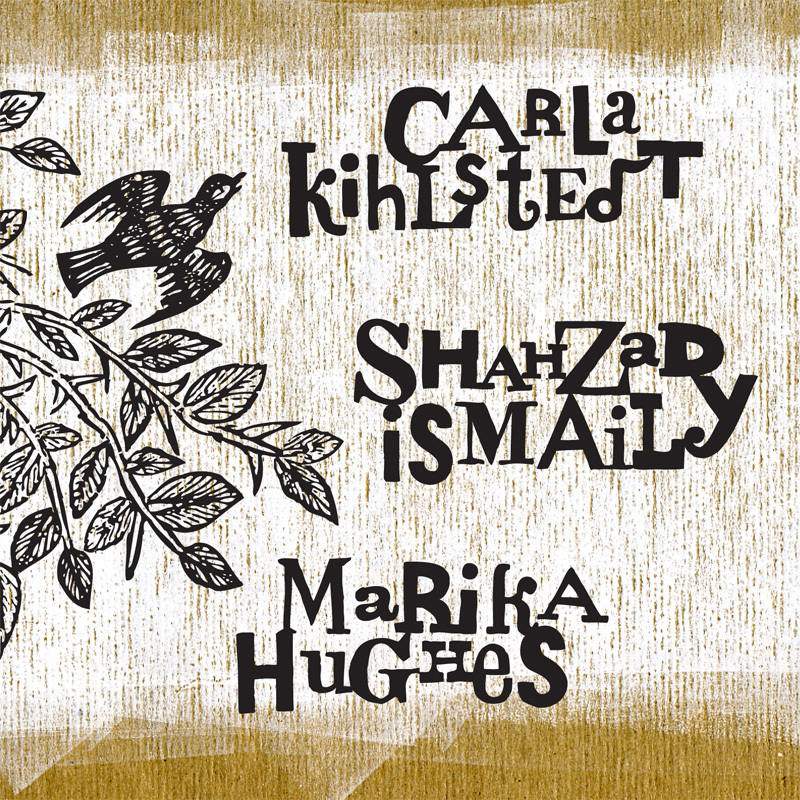 I loved illustrating the spirited intertwined branches with flowers, berries, and bugs! 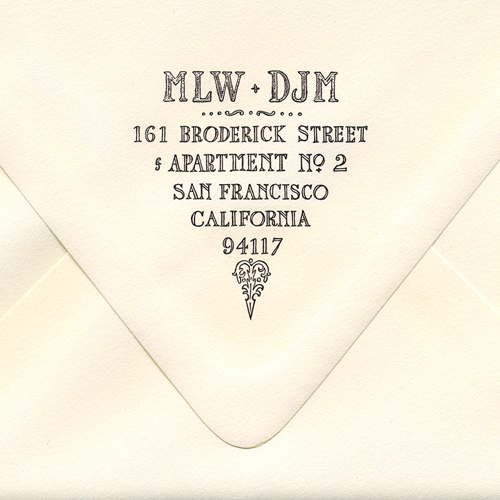 A playful return address for the invitation envelope. 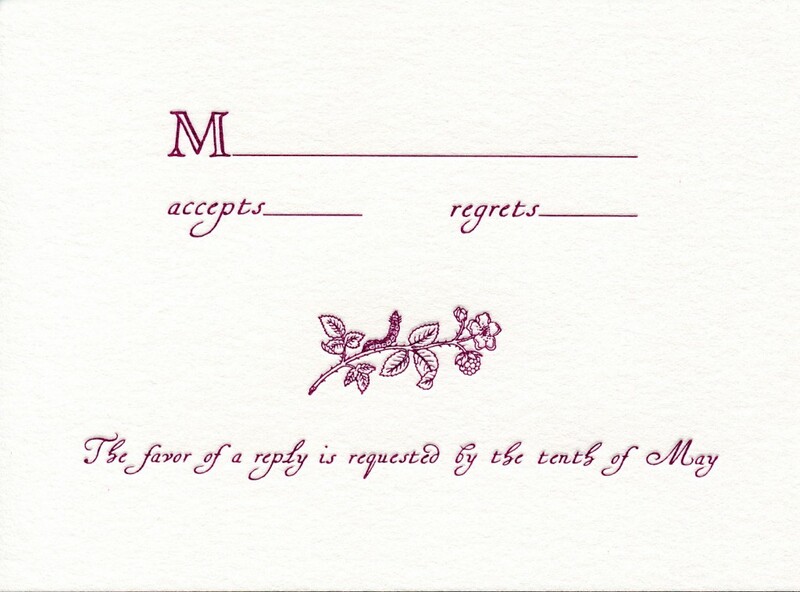 The reply card. I love the little reaching caterpillar! One of my most enjoyable projects that involved a lot of hand-lettering was for 2 Foot Yard’s album, Borrowed Arms. The music is hauntingly beautiful and I feel very privileged to have worked with such talented musicians / artists. I drew inspiration from Natalia Goncharova, a Russian avant-garde artist that I admire very much. 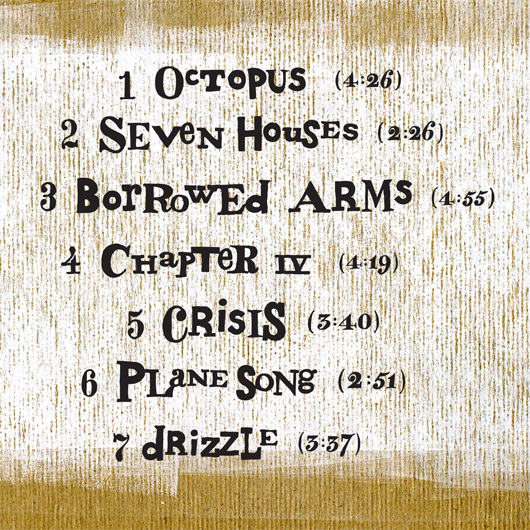 Here are 7 of the 13 track names. It never ceases to amaze me how expressive typography can be.